Turkey tacos are one of my super simple stand-by recipes. Fire roasted canned tomatoes, chopped onion and cumin couldn’t be an easier seasoning for ground turkey or beef. Add raisins for a sweet contrast to the spice – like in my recipe for Raisin Serrano Quesadillas – and raisins make a jazzier taco too. Offer shredded cheddar and lettuce to finish the tacos. Now that’s simple – just 6 main ingredients and 15 minutes till dinner! And tacos happen to be one of the hottest trends in 2015, according to a Restaurant News article that flashed by my computer as I wrote this post. 1. In a 10-12-inch skillet brown meat and onion. Add cumin and stir 1 minute. 2. Add tomatoes and raisins; cook until heated through. Season to taste with salt. 3. 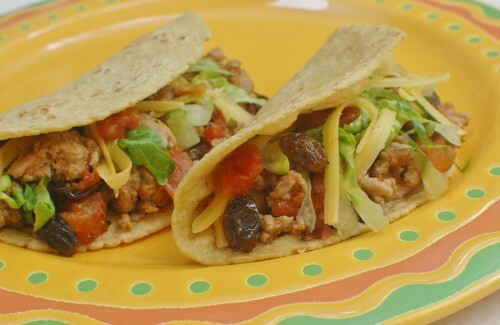 Warm tortillas and fill with meat. Serve with lettuce and cheese. *The flavor and heat of canned fire-roasted tomatoes varies. Try different brands to find your favorite. A dash of cayenne or red pepper flakes can always be added to taste. I love the idea of “super simple” and “tacos” in the same recipe! Not that tacos are complicated per se, but sometimes there seems like a lot of parts and pieces to get together. Yours sound wonderfully nuanced, yet easy to put together. Bueno! Yes, it’s so simple it surprised me too for the amount of flavor. Of course, you could dice avocado, cilantro, add sour cream — which would take just a few more minutes. I hear you, but I also like the idea of your flavorful base not getting, I don’t know, polluted! Looks yummy! I’ll make it Paleo –skip the tortilla and cheese, serve over lettuce. It will be just as delicious Paleo style. I know you’ll like it!